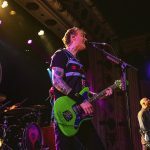 Alkaline Trio played the first of four consecutive sold-out nights Thursday at Metro, marking their first hometown club show since the release of their latest album, 2018’s Is This Thing Cursed? 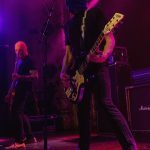 The record represents arguably the band’s strongest output in over a decade, as it captures the spirit of their earlier work, while simultaneously incorporating new influences and raising the overall level of musicianship. Before the start of the show, there was a palpable sense of excitement in both the line outside the venue and at the neighboring GMan Tavern. 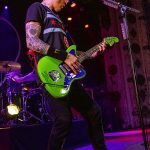 Fans wondered aloud as to how much new material would be presented in the setlist and what surprises Alkaline Trio might have in store. Suffice it to say, those in attendance were likely more than satisfied with the comprehensive, 20-song set the band delivered. 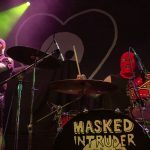 Madison’s Masked Intruder kicked off the evening with their patented take on Ramones-inspired punk. Their sound also incorporates elements of classic Lookout! Records pop punk and doo-wop vocal styles, in addition to contemporary influences. 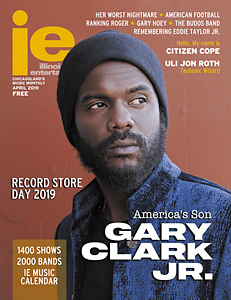 All of that and more was on display Thursday, during a live performance that has developed considerably since the band’s early days. They plowed through song after song, pausing for barely two to three seconds in between. 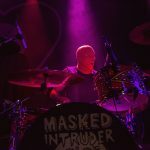 Highlights included the skillful guitar leads of Intruder Blue and the vocal harmonies between him and bassist Intruder Yellow. Intruder Green and the band’s resident hype man, Officer Bradford, went all out to get the crowd involved and assisted in winning over some new supporters. 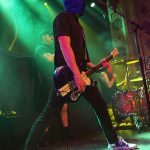 Their set was comprised mainly of songs from their first two full-lengths, but they also played a promising new song, which should leave fans eager for their next record. After a brief 15-minute break the lights dimmed, and Alkaline Trio took the stage. They immediately launched into “We’ve Had Enough,” the lead single from their 2003 album Good Mourning. 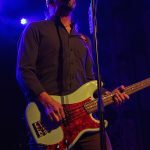 Singer/bassist Dan Andriano did an admirable job with the backing vocals that Keith Morris, (Circle Jerks/Black Flag) provided on the recorded version and the crowd responded by screaming along with him. With that song being one of the faster and more aggressive entries in their catalog, it was a great way to start the show. 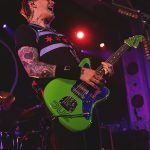 A few songs later they played “Blackbird,” the first track from the new album and one that drew attention to the range and power of singer/guitarist Matt Skiba’s vocals. 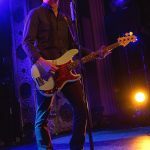 It was followed by “Mercy Me,” which had nearly everyone in attendance singing along to the line “I took a long walk straight back home/I could ‘of walked back to Chicago.” It was a definite high point of the set but was perhaps overshadowed by what the band did next. 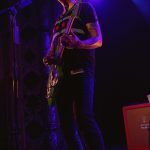 Alkaline Trio responded by playing three songs in a row from their first two albums, (“Cringe,” “She Took Him to the Lake” and “Clavicle”). 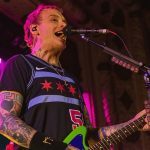 The crowd erupted in approval and Skiba, and Andriano seemed to be smiling throughout the three-song stretch, possibly fondly recalling the band’s early years. They then went about tackling two of their more complex songs, “Sadie” and “Time to Waste,” both off of 2005’s Crimson. 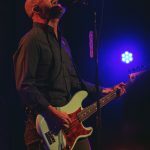 It was here that drummer Jarrod Alexander, who’s currently filling in for Derek Grant while he addresses health issues, shined brightest by discreetly adding his personal touch. However, that’s not to imply that the signature groove and creative fills that Grant provides were not missed profoundly. 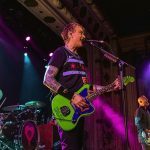 They also played the title track off the new record, as well as “Demon and Division,” the latter of which found Skiba remembering the days when he lived near that intersection, (Damen and Division) and it wasn’t exactly the affluent neighborhood that it is now. The band similarly closed their set how it began, with a song from Good Mourning. This time it was “This Could Be Love,” with its horror-themed chorus that fans seemingly shouted along with every word. 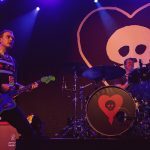 Alkaline Trio left the stage, and the crowd reacted by chanting “One more song! One more song!” After the obligatory waiting period, the band returned and delivered two more, “Warbrain” and “Radio.” Although they often close with “Radio,” it still packs quite the punch, building slowly in intensity from a lone guitar lead to the entire band crashing in for the distorted and fiery chorus. It was an appropriate ending to a night that was as much about celebrating the past as it was reveling in the present. 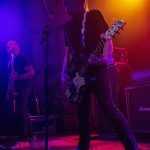 Alkaline Trio was in top form on a stage where they not only feel most at home but perhaps where they are at their best. Great review. Clearly knowledgeable fan. Wish I’d made it.